My mother has never said this directly to my face, but I know she thinks I'm a slob. Even when my sister and I lived 'at home' and were going through our slovenly teenage phase, her house was immaculate. The windows always shone, and there was the feint scent of Mr. Sheen in the air. I prefer to think of myself as 'domestically challenged.' I go through stages of really trying to keep the house pristine, the showers sparkling and the floor crumb free. Then I remember that - one - I have kids, and any attempt to keep the floor tidy is sabotaged by Lego and My Little Ponies. Two - my kids either want to help out and it takes three times as long to get the washing etc done, or they stage a mutiny and NOTHING gets cleaned. Three - I really HATE housework. I am fortunate enough that my Mum takes care of the girls on the two days a week I work. I love that they all get that time to bond, and they learn so much from my Mum - the fact that she was a kinder teacher for 20 years and still has a lot of the toys and books she purchased makes for an exciting trip to grandma's house! This year however it has worked out that Shannyn's kinder is on my work afternoons, so Mum has been staying at my house. When Shannyn is at Kinder and Ashlee has her nap, my Mum gets bored, so she CLEANS - yes, cleans! my house. I am grateful that she does it, I have told her it is not necessary - but she says it gives her something to do. A point is reached however, when I find she has started to tidy such places as my underwear drawer, luckily there is nothing incriminating in there (!) but come on! She said to me yesterday that she changed the sheets on the master bed because she couldn't stand the smell! Which brings me back to my opening statement - she thinks I'm a slob. So what do I do? 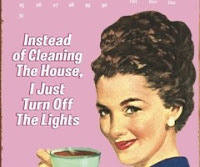 Tell her to change away - use her as an unpaid maid of all work (which I really hate to think I am doing) or tell her nicely to back off - my house may not smell like Mr. Sheen, but the housework DOES get done......... occasionally!! Heh. My own mum I can deal with my mother in law NO. Feel so judged!